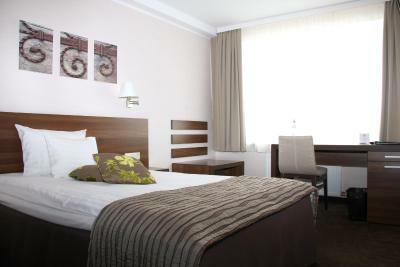 Lock in a great price for Mercure Marijampole – rated 9 by recent guests! 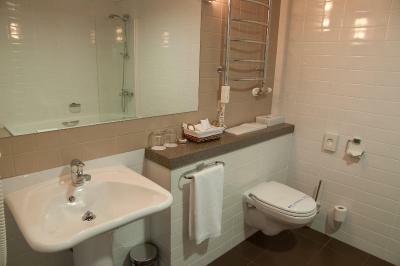 Sparkling clean bathroom! A nice view from the window. The wellness section was why I chose this hotel to sleep there after a day of driving . There was jacuzzi, Finnish sauna (hot and steamy enough, which is rare), aromatic sauna (with dry, low temperature, not so impressive) and steam sauna (of the Turkish flavor, excellent). There is a large outdoor terrace you can enjoy the free tea prepared for you. On the same floor there is a quite well equipped gym. The room was OK, air conditioning worked, it was well controllable, the bed was comfortable. Breakfast was good, coffee about average (for a coffee machine). The restaurant was really great, and very fairly priced; dare I say one of the best steaks I have had in Europe since I've been here. Very comfortable. Amazing view through the window. 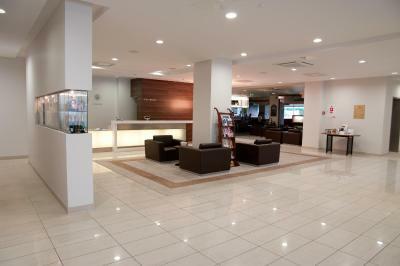 The interior of the hotel looks modern and new. 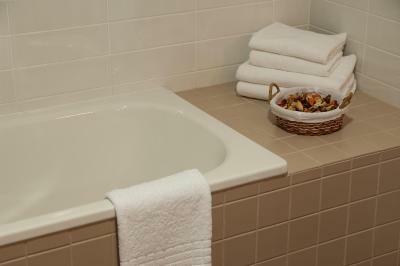 The hotel room was very comfortable and clean (the bathroom is large and there is a bathtub). The breakfast was really good, great selection and high quality (we especially liked the turkey ham). Overall, great value for money. If you are travelling down the E67, this is the place to stay! Amazing view from the 6th floor window, comfy room, good breakfast, nice staff. Everthing is ok. Stuff helped me very much. Room was very clean. Hotel was the center of in the city. Therefore It was easy to go somewhere. When I need a stay overnight on my way I like to choose this hotel, because the room is spacious, comfy bed and nice staff. And it's close location to the main road. A very helpful and friendly reception and the restaurant staff were also very nice. We had a lovely late meal and wine. It was a family friendly atmosphere. 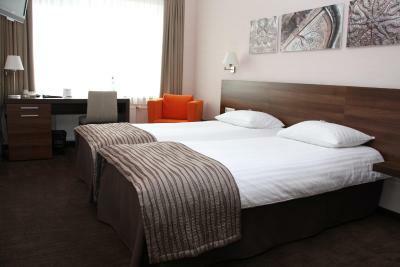 Mercure Marijampole This rating is a reflection of how the property compares to the industry standard when it comes to price, facilities and services available. It's based on a self-evaluation by the property. Use this rating to help choose your stay! 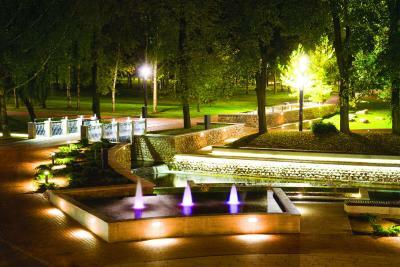 One of our top picks in Marijampolė.Mercure Marijampole is a 4-star hotel in the center of Marijampole in Southern Lithuania. 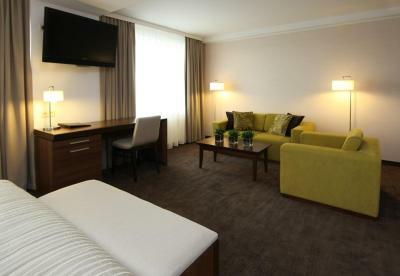 The modern and cozy rooms feature comfortable working and relaxation areas. 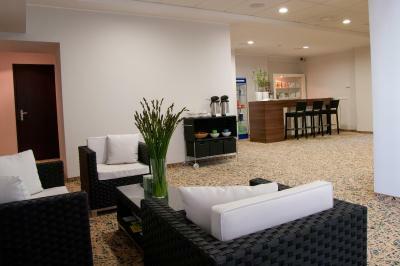 Mercure Marijampole has a modern conference center with a capacity of up to 200 people. The health and fitness center includes a steam bath complex, a sports bar and several workout gyms. The PJazz hotel restaurant is famous for its high-quality food, friendly service and great atmosphere. 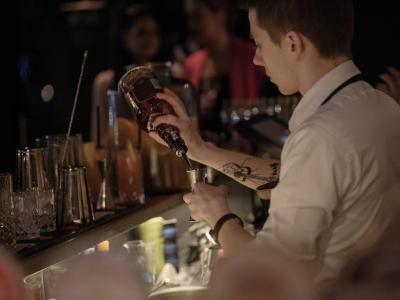 The property's WINIS night bar offers its guest a wide selection of cocktails. 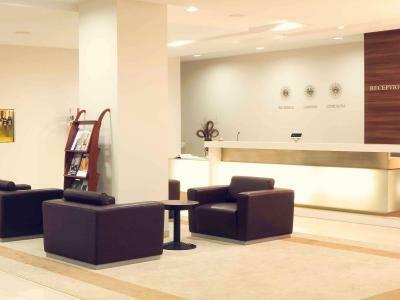 The hotel participates in the Planet 21 program aiming at environment friendly tourism. 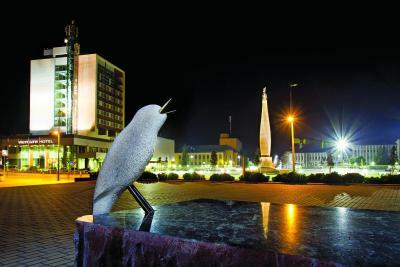 This property also has one of the top-rated locations in Marijampolė! Guests are happier about it compared to other properties in the area. This property is also rated for the best value in Marijampolė! Guests are getting more for their money when compared to other properties in this city. 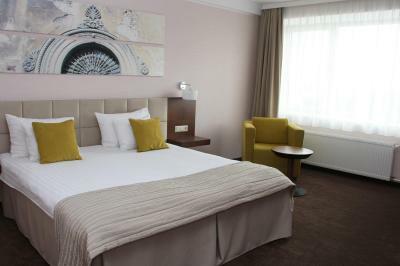 When would you like to stay at Mercure Marijampole? This single room has a electric kettle, mini-bar and air conditioning. This twin/double room has a cable TV, air conditioning and electric kettle. Includes free access to saunas and the hot tub. 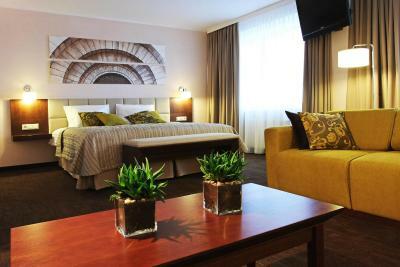 This twin or double room features air conditioning and mini-bar. 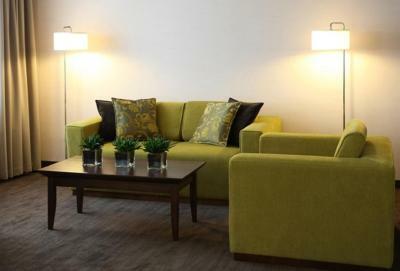 Great breakfast, cleanliness, fantastic location in the city centre are just few of our hotel's highlights. 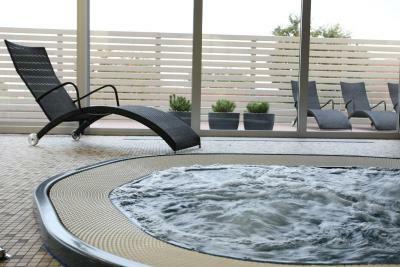 We are proud to invite our guests in our marvelous spa centre and our lovely staff will help everyone in need. Come see for yourself! 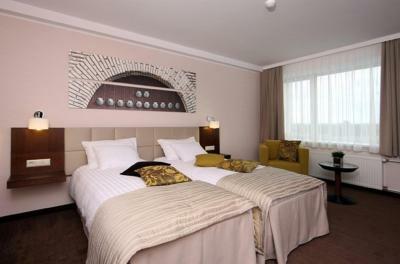 House Rules Mercure Marijampole takes special requests – add in the next step! Mercure Marijampole accepts these cards and reserves the right to temporarily hold an amount prior to arrival. 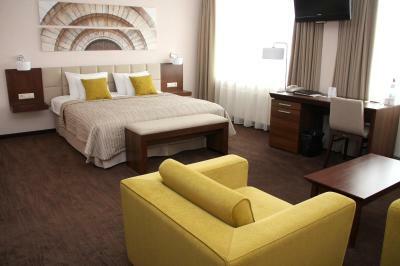 Comfortable room, great restaurant, pet friendly. I only had to tell them to clean my room once. I have no other complaint about the hotel. Was difficult to heat the room. Bathroom was a little bit cold. Dirty towel under the bed! The qween size bed was not comfortable, because it was simply connected of two beds. Check in personnel didn’ t smile. It was very cold in a breakfast hall. 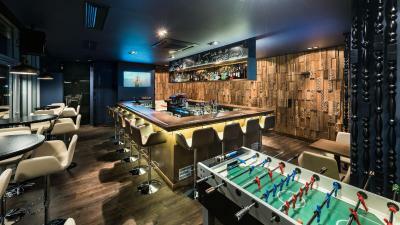 Staff were very welcoming, lovely bar and restaurant with plenty of choice. Fast easy check in and out. The price is quite high for such a small provincial town Matijampole. During check in it turned out that kitchen is not working, restaurant is closed and the breakfast for one day was just a "dry meals" due to some damage/situation in the kitchen...apart from this, it's a decent hotel. There was a group of drunks shouting on the town square at 3am, but it's not really the hotel's fault. 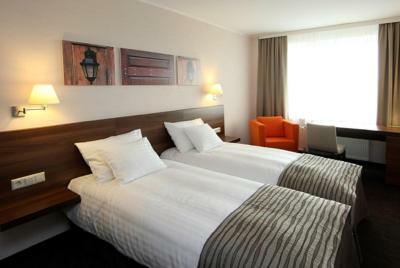 The size of the room, nice bed, very helpful front desk staff.